Neil Young and Crazy Horse’s forthcoming album Americana will be all sorts of American pastoral, but of course the musician who’s also been busy inventing his own kind of MP3 would never be able to abandon the modern entirely: He’s tapped ultra-contemporary artist Shepard Fairey to pair each song with an illustration. The paintings, the New York Times’ ArtsBeat reports, depict edited scenes from American history, like the British Queen and Betsy Ross sewing a patchwork British/American flag (to represent the duality of the “God Save the Queen”/”My Country ‘Tis of Thee” melody), and will be on display to a lucky few for one day only at Los Angeles’ Perry Rubenstein gallery before being sold to private collectors. The lot will, however, be brought to the people (this is Shepard Fairey, after all) via stage designs, album art, and music videos, and it’ll be widely available for viewing on the Internet sooner or later. The record itself will finally be out June 5. This isn’t the first time Young has requested Fairey’s artistic talents. 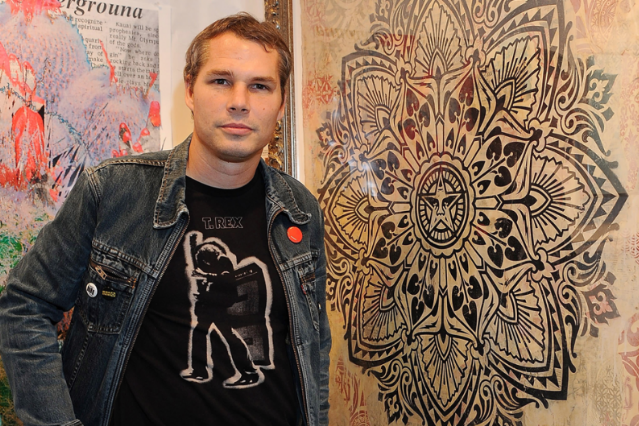 In October, when Young celebrated the 25th anniversary of his annual Bridge School Benefit shows, he asked the street artist known for his Obey Giant campaign (as well as Barack Obama’s famous Hope poster) to take care of the cover art for the live recording and commemorative poster designs. Prior to meeting Young, Fairey had a bit of a thing for the guitarist’s music, too. Last spring Fairey also lent his urban expertise to Death Cab For Cutie for their “Home is a Fire” video.